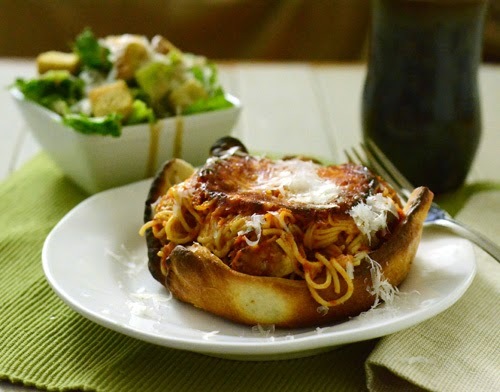 The most popular post my blog has ever had was my idea for a Spaghetti and Meatball Pot Pie. It was simple, just put your favorite spaghetti and meatballs in a ramekin, top with pizza dough, brush with garlic herb butter and bake until golden. This weekend I made a shortcut version of that instead of making my own meatballs, sauce, and dough. It's just a different way of presenting your favorite spaghetti, meat sauce, and garlic bread in a creative way. 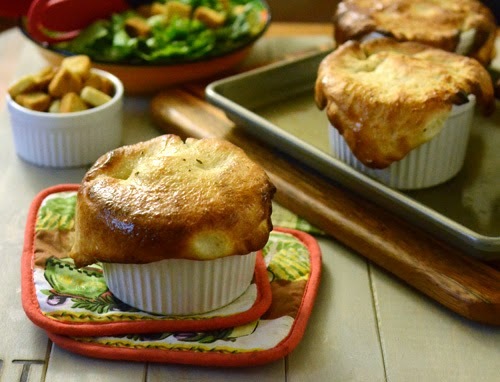 Be forewarned, these pot pies are very filling and will leave you stuffed. You could also turn this into a holiday appetizer by downsizing to small ramekins. Preheat oven or a grill to 450f (or what temperature the pizza dough calls for). For a standard charcoal grill, bank to coals to the sides and put a pizza stone in the center. For a gas grill, turn the outer burners on with the pizza stone in the center. For a kamado grill, set up for indirect heat with a heat diffuser (Big Green Egg use plate setter legs down). Place meatballs and pasta sauce in a pan and simmer according to package directions. Mix the butter, Italian seasoning and garlic salt in a small pan over medium heat until melted. Lightly spray the inside of the ramekin and the outer edge (where the dough will wrap) with non-stick spray. 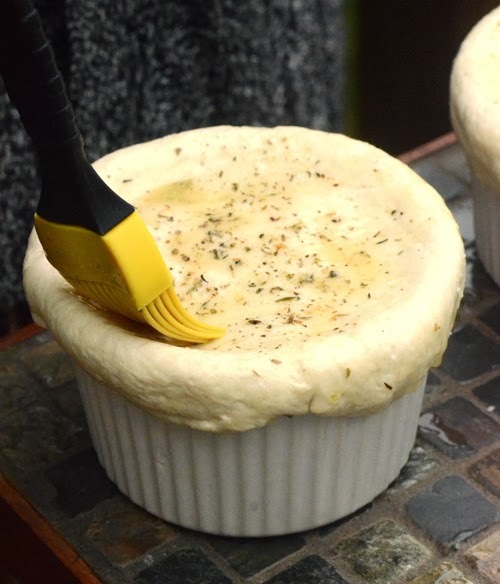 Unroll the pizza dough and cut circles that are 1/2" wider than the mouth of the ramekin. 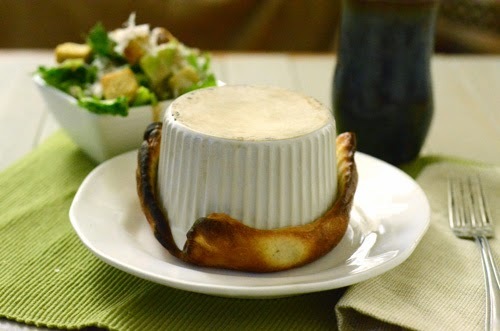 Place 1/4 cup of shredded mozzarella in each ramekin. Mix the meatballs, sauce, pasta, and remaining cup of mozzarella together. 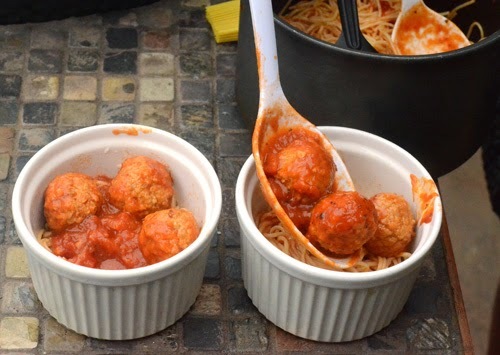 Fill each ramekin with 3-4 meatballs and the sauce pasta mixture. 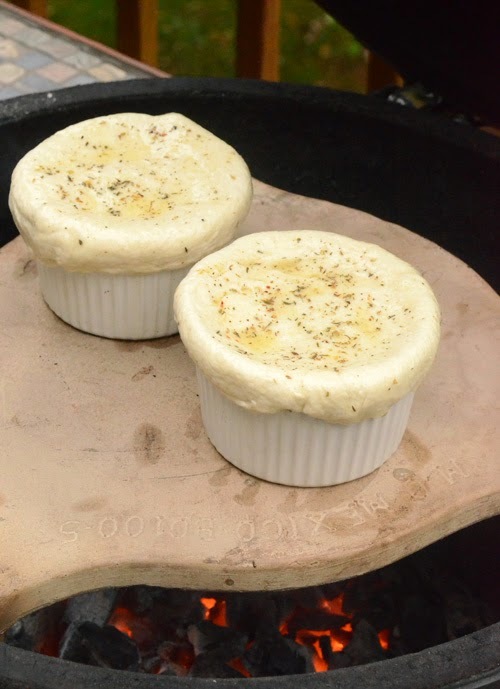 Top each ramekin with dough and seal the edges around the ramekin top. Brush with the garlic herb butter. Bake until golden brown according to the pizza dough instructions, about 15 to 20 minutes in most castes. 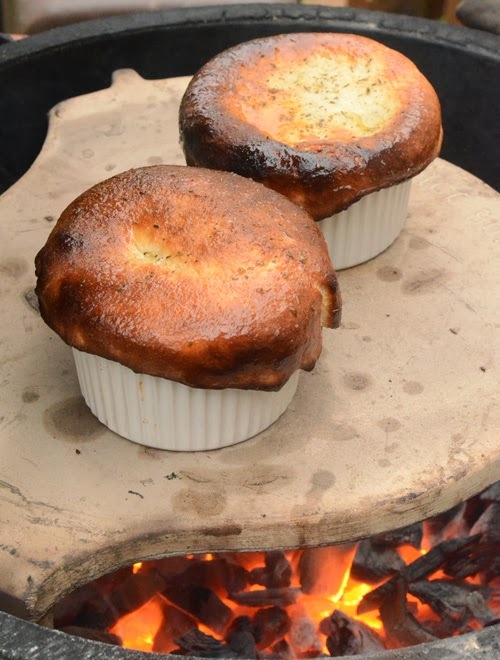 To serve: Handle ramekins with heat resistant gloves. Top the pot pie with a plate and turn them both ever. 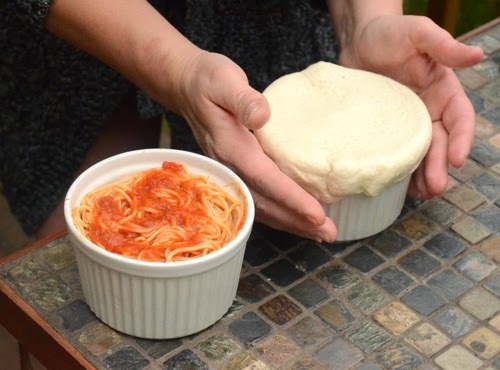 Carefully lift and twist the ramekin to remove it, leaving the pot pie crust as a bowl topped with the spaghetti and meatballs. Garnish with fresh basil, parmesan cheese if desired. 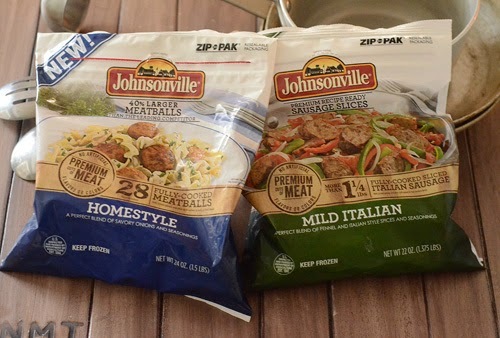 One of the things I like about working with Johnsonville is that I get to try out their newest products as they become available, like their new Johnsonville Meatballs and Johnsonville Sausage Slices. I was curious to try the meatballs since they are made with premium cuts of pork instead of the beef meatballs that I normally make. All 3 of us liked the meatballs, they were big, flavorful, and moist. These meatballs are 40% larger than competing products (24g vs 14g) and come in three varieties, Classic Italian, Three Cheese, and Homestyle. The bigger size makes them perfect for a quick and tasty meatball sub, which is how I finished off this package. 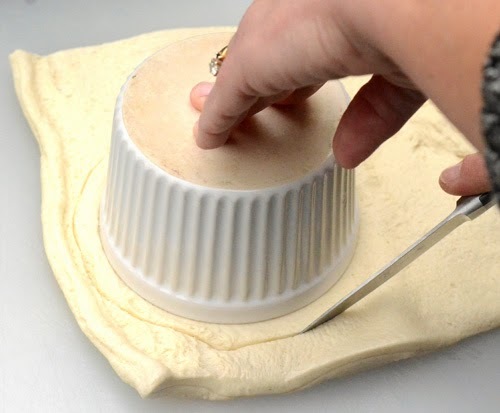 Depending on the size of your ramekins, you might be able to cut all tops from just one package of dough, especially if you stretch the dough out first. We didn't stretch it, we wanted a thick crust. Meatballs are the star of this show so make sure every pie gets at least 3. To seal the crust, lightly press and tuck all of the was around the edge. The garlic herb butter is used to make the crust taste like garlic bread. Sure you can do this in the oven....but you know me. I got this batch a little too dark but they were still delicious. ...so that the crust becomes a crunchy, garlicky, edible bowl! My favorite part is the cheese on the bottom of the ramekin. It gets crispy and gooey while cooking and ends up on top as a delicious crust, like baked spaghetti. The Johnsonville Meatballs and Johnsonville Sausage Slices started shipping to some locations in October and will be available nationwide over the next two months. I plan to pick up another package or two to keep in the freezer to have on hand for quick meals. [Standard Disclaimer] I received these free samples from Johnsonville.